Maybe its because I am a post-war Brit-baby boomer, (Birmingham in 49)? Nah! We emigrated to Canada in 1954 so I am pretty much Maple-Leaved all the way. Could it be those two Austin Mini 850s I owned in high school and University? Definitely a factor! But what has REALLY kept my interest in British cars for 35 years even though I havent owned one since about 72? The smell. I just love the way British cars ooze a special olfactory combination of oil, leather, rubber, grease and, well, how do you describe it? If you own a British car you probably know what I mean. They have a very distinctive aroma; if you like it, you are hooked! My first Mini was a white woody wagon. A friend of my mother was getting rid of it so we paid her what she said the dealer was going to give her on a trade. I still think Sue low-balled it to give mum and me a break on it. I worked at a many jobs and saved, saved, saved from 14 to 16 to buy a car, and here it was. I was in love. I even owned it before I had my 90 day learners permit (which I got on my 16th birthday). What memories! The very first drive after I got my licence was to the newly opened Yorkdale Mall. I recall to this day the awesome feeling of freedom. Fortunately I worked part-time at Karls Esso on Kingston Road, cutting my teeth on oil changes, lubes and tire repairs. Hank Galster and I worked every Sunday night shift; he spent hours teaching me about lubricants (he worked full time for Imperial Oil and just had fun at the gas station one shift per week. He said it kept him in touch with customers needs). He and the rest of the guys showed me how to use tools properly, diagnose and fix things, weld and of course, the Mini was the guinea pig. But as soon as a B rang the bell at the pump I was the first one out the door to fill it up (may I check under the hood sir? just so I could gawk). They left with the cleanest windshield in West Hill! I wanted one. I had the itch. I drove that Mini harder than I probably should have. One day it threw rod #3 out the side of the block at Lawrence and Kingston Road. Heartbreaking! But soon another little Mini pulled into the station with a for sale sign. Not a wagon, but newer, bright red and within budget. More memories. Still not a B, but I could pretend. I taught Patty to drive on that one. No synchro-mesh in 1ST gear but my then-girlfriend once downshifted from 4th to 1st going down a hill in Peterborough and she got it in! Buried the tach at about 6 grand, the front bumper almost scraped asphalt and I went into the windshield (no seat belts in those days). I still married her a few years later, but only because the Mini took the punishment and kept going. We still chuckle about that one... you said downshift, so I did. To this day she hates a standard. Canada Day, 1972 I think. Patty and I were on the way to Morningside Golf Course to meet her Dad for a round. We never made it. Northbound at the crosswalk just south of Lawrence the Mini was rear-ended. The trunk lid practically came into the back seat. My first reaction? I just finished waxing this thing last night! Never thought about how WE were, nor the pedestrian we were pushed into. (Fortunately, everyone was ok). The Mini was a write off. Happy Birthday Canada; R.I.P. Mini. So ended my stint with British cars. Never did get a B but always admired them and kept saying .. one day! Three kids came and grew up. We went from coupes to sedans to an Aerostar to an Explorer and now a Grand Cherokee. I kept seeing Bs and thinking one day I am going to scratch that itch. I kept thinking of my dear departed father-in-law, Roy, who always wanted a Jag. He never scratched that itch (even though he could have afforded to). I never understood why, but decided I would not to make the same choice if the opportunity arose. When the Internet came around I read every web-site on MGBs. I looked in Auto-trader, scanned E-Bay, talked to people and generally knew just about everything about MGBs, but only casually entertained actually getting one. Patty and I planned a 30th anniversary five week trip to Europe. Two days before departure son Matt came home and said one of his pool customers wanted to get rid of his 1981 MGB. I was intrigued because I knew they stopped making them in 1980, so how could this guy have an 81? I called Steve and he told me the car was with Trevor White, in storage. With two small children he simply did not have the time or opportunity to enjoy it. I called Trevor and he said he would bring it to his shop in Aurora from Port Perry tomorrow, Canada Day! The irony was not lost on me. We were leaving for Europe the NEXT DAY so I had to make a quick decision. When I arrived at the shop the car was on a battery charger not an auspicious start. It had let Trevor down on the way over. I asked him to tell me about the car. He said it was a gem. Solid body, original, no rust and it cruised nicely at 100kph with no problems. All it needed was a new alternator. It was built in August 1980 as part of the last 1600 Bs made, most of which came to Canada as Mark IVs (with a KM speedo) and hence registered in 1981, even though it is a 1980 model year. When you listen to Trevor talk about MGBs there is a tone of passion in his voice. I never met him prior to this and did not realize until afterwards that he is/was president of the Toronto MGB club. I got the immediate impression that he was giving me the straight goods on this car and he said it was worth at LEAST what Steve was asking for it. I snapped 4 pictures on the digital camera and headed home to do a selling job on Patty. To my surprise and delight she did not push back hardly at all. I called Steve, told him I was leaving in 12 hours for 5 weeks but could I please give him a deposit to hold the car for me until I got back? He agreed. The itch was scratched! It felt good. Europe was great but I kept oogling at those pictures in the camera and looked forward to getting home to my new toy. I showed everyone on the trip my new B, and described how I planned to paint it red. Someone asked me if I test drove it. It was then that I realized I had not even heard the engine run! In Germany I saw a fully restored MGA and spoke with the owner (in English). That just peaked my excitement about getting the MGB even more. Little did we know that my son and his customer cooked up a nice little surprise. Daughter Alyssa picked us up at the airport. She said I have to call Matt when we get to Yonge Street. So she did. As we pulled into the driveway guess what came out of the garage to meet us? Right! Steve and Matt went up to Trevors and got the B so I could have it when I got home. We took it for a spin around the block before we even took the luggage out of the car. Then I learned Steve had Trevor certify it and even signed over the ownership so I could get it plated immediately. Within 24 hours we had it insured, plated and on the road. Now I am a proud owned of an MGB and have joined the MGCCT. It is a beauty. I love it. And it is staying Black! Now please excuse me whilst I pop the bonnet and have a sniff. See you soon on a cruise! Peter Mittler, B Owner thinking about an appropriate Vanity Plate. How about WANTEDAB? What has SCUBA diving (Self Contained Underwater Breathing Apparatus) got to do with driving a sports car? Diving? Driving? More than you might imagine. In the last issue of Octagon (Scratching an Itch Summer 2003), I related a story to you about the acquisition of my new 1981 Black B. 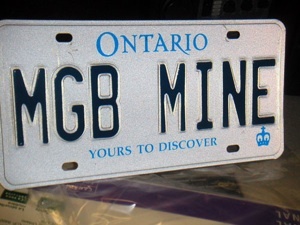 Seven weeks later, after ordering the vanity plates MGB MINE and enjoying the car for a very brief time, MGB MINE became MGB RIP as she went out in a blaze of glory in downtown Uxbridge after winning the Heart and Stroke Rally put on by British Sports Car Center. One hack was heard to say you should have ordered MGB BBQ. All kidding aside this was a very sad and traumatic experience but it could have been worse. Even though I was NOT prepared, others were. Would you have been prepared? Having been a SCUBA diver since 1972 I reflected upon the safety precautions that we take when diving. The mandatory whistle to call for help, the buoyancy compensator for floatation control, the gauges for depth and tank pressure, the buddy system and the least used, most forgotten but probably the most important piece of safety equipment, the Octupus regulator for your buddy. We dive with TWO mouth pieces on our regulator; one we use and one we are cautioned never to use for ourselves. Let me explain. In the early days of diving we learned to buddy breathe. If someones equipment packed it in at depth, the two divers would ascend by sharing the others breathing apparatus. Buddy breathing requires some skill and practice, but can be mastered. With the advent of better technology coupled with the increasing desire to avoid putting something into your mouth which has been in someone elses mouth (especially during training sessions) SCUBA gear manufacturers added an additional second stage and mouthpiece FOR THE USE OF YOUR BUDDY. Thats right, if your regulator packs it in you are not supposed to grab your own Octupus, but rather use your buddys Octupus which is carried for YOUR USE. Of course, in a supreme emergency you might just have to use your own, but it is not a preferred practice. When MGB BBQ sprang a fuel leak and burst into flames I had no "Octupus in the car. i.e. No Fire Extinguisher. But my buddies did. I ran back into the restaurant to hail the gathered MGCCT members to assist. Quickly they came, ran to their cars, got their Fire Extinguishers and blasted the car. While they didnt put it out they subdued the flames buying some time for the Uxbridge Fire Department to arrive and complete the task. I am sorry but do not know who the person is in this photo but thank you for your help! For certain you can get very hurt in situations like this. I do not want anyone to take this article as an endorsement of pyrotechnic heroics. However, I will never be put into a position again where I am so totally HELPLESS than I cannot help myself or another motorist in trouble. You cant trade the value of a twenty five dollar fire extinguisher for the seconds it might save, the vehicle it might save or the life it might save if you have one in the cockpit, not the trunk. Most of the time we drive our Sports Cars with buddies. We do it because it is fun to share with other enthusiasts and because it is safer to have a convoy of like-kind vehicles and like-minded drivers together on an event. So, get a Fire Extinguisher. for your buddies. And if you need mine, it will be ready! Anytime. Comments on "Scratching an Itch"
And now it is bein restored! In RED!